Rocky is back with his protégé Apollo Creed in the next film in the Rocky saga. This is the sort of PR stunt I like for movies. It’s not all that innovative as it’s become a cliché of itself. On the other hand, it is what you need first thing in the morning. A great wake up and get to work call. It does bring a smile to everyone’s face. 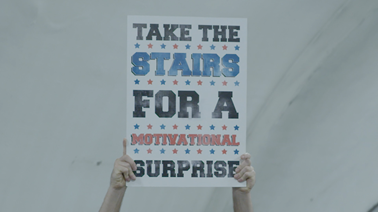 Not just the people who took the stairs but everyone else around them. Adonis Johnson never knew his famous father, world heavyweight champion Apollo Creed, who died before he was born. Still, there’s no denying that boxing is in his blood, so Adonis heads to Philadelphia, the site of Apollo Creed’s legendary match with a tough upstart named Rocky Balboa. Once in the City of Brotherly Love, Adonis tracks Rocky down and asks him to be his trainer. Despite his insistence that he is out of the fight game for good, Rocky sees in Adonis the strength and determination he had known in Apollo — the fierce rival who became his closest friend. Agreeing to take him on, Rocky trains the young fighter, even as the former champ is battling an opponent more deadly than any he faced in the ring.